My first impression: Sounds like a fantastic, intense read! I love a YA book that tackles a strong subject. When I heard about The Miseducation of Cameron Post I wanted it right away. I felt a connection with Cameron before I even had the book in my hands. That is a rare thing! I devoured the book. It was exactly what I thought it was going to be; Strong and intense! 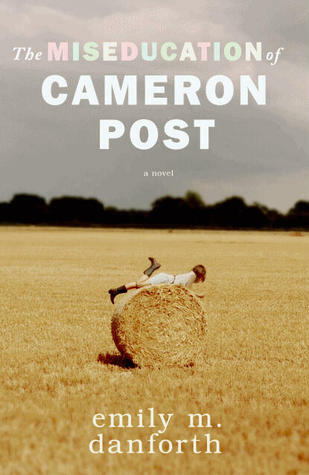 The Miseducation of Cameron Post is NOT a light read. Not only does it bear a hefty 480 pages, the books packs a lot of heart. You will fall for these characters in a way you didn't think you could. Although I enjoyed the first 200 pages or so, I didn't think it was all necessary. The author put a lot into character development, so the storyline didn't go exactly how I thought it would. After finishing the novel, I realize every word in that book was needed. The Miseducation of Cameron Post would not have been the same if even one page was missing. Those first few chapters of introducing Cameron were necessary to get to know Cameron, to learn about her...to understand her. Cameron was a profound character. She was pure and honest but most importantly she was realistic. The Miseducation of Cameron is a very character driven novel, and I don't think I would have enjoyed it any other way. Please don't misunderstand me, the book packs a beautiful storyline; Raw and honest, but that storyline wouldn't have had the same effect if the author didn't put so much delicate care into her characters. Emily M. Danforth crafted something beautiful. A book about a small town, tragedy and self discovery. Last impression: An awe-inspiring novel. This book should be in the hands of all boys and girls who are still discovering themselves.